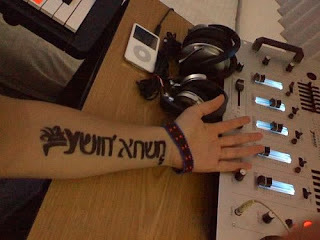 Bad Hebrew Tattoos: Say What? A prime example of Hebrew tattoo gone terribly wrong. It's supposed to say something along the lines of "Jesus the Messiah", but it does no such thing. It is just meaningless gibberish. If you're all set on "Jesus the Messiah", how about a nice manly pendant instead? I think your not being fair. The first word looks like Aramaic for the Messiah so it clearly says 'CHoshea is the Messiah. Of course they probably meant Hosea is the Messiah? Can't win 'em all. I'm no expert where Aramaic is concerned, so you might be right, but it sure looks like bastardized Hebrew to me. In twisted Aramaic: "Meshicha Yehoshua" which could make sense unless Yod was replaced with an apostrophe.